The 2018 Ford Fusion Hybrid and Fusion Energi are now in their sixth model year, older than any competing mid-size sedans with high-efficiency hybrid or plug-in versions. Mildly refreshed last year, the Fusion remains a good-looking sedan with a comfortable and stylish interior. The hybrid Fusion has four trim levels: the base S, the mid-level SE, the premium Titanium, and the top-of-the-line Platinum. The plug-in hybrid Fusion Energi comes in SE, Titanium, or Platinum trim levels. We give the Fusion Hybrid and Energi an overall score of 7.5, adding points for a still-handsome design, rewarding handling, a pleasant and high-quality interior, and active-safety systems updated to stay competitive. Newer competitors, however, simply outdo the hybrid Fords’ EPA ratings for fuel economy, electric range, or both. Those include hybrid versions of the Chevrolet Malibu, Honda Accord, Hyundai Sonata, Kia Optima, and in particular a new 52-mpg Toyota Camry this year. Competitors for the Fusion Energi include plug-in hybrid models of the Sonata and Optima, a Honda Clarity Plug-In coming this year, and the smaller Chevrolet Volt hatchback. The hybrid Fusion may still return higher ratings than conventional mid-size sedans, but buyers who prioritize low fuel costs or electric range over all else now can do considerably better than the Fusion hybrid pair. Prices also can add up quickly for buyers who tick the option boxes on the Fusion order form; the best value may be the base hybrid that starts at around $27,000 before discounts, which have been ample for mid-size sedans of late. The 2018 Ford Fusion design is no longer way out in front, but racy lines and a stylish, well-made interior still exceed the average. We give the Fusion 7 out of 10 points for its design, adding one point for its still-handsome exterior and another for an interior that’s lasted well and still feels more expensive than it is. The rest of the segment has come much of the way toward catching up with the Fusion, but it’s still a desirable design. The large oblong grille opening was widened and made crisper last year, with LED headlights inside chevron-shaped running lights. The shape is sensitive to color, though: light colors give the impression of thickness through the middle, whereas dark tones play up the sporty lines. The interior will be familiar to owners of recent Fords, with a mix of black or two-tone soft-touch materials and the matte silver accents now found in many vehicles. 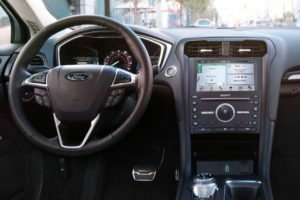 The hybrid and plug-in hybrid Fusions have an all-glass cluster of instruments that drivers can configure to show the data and graphic displays they prefer. Radio settings and climate controls remain as conventional knobs, thankfully, though other controls have capacitive touch-sensitive buttons that require some training to use and can prove frustrating. The earlier, much-reviled voice input system called MyFordTouch was replaced two years ago by a simpler, quicker, more functional Sync 3 interface, and complaints have died down. The 2018 hybrid Ford Fusions are enjoyable to drive, with recent tweaks to driving feel and some of the best roadholding among mid-size sedans. The 2018 Ford Fusion Hybrid and Energi share the same 2.0-liter inline-4 engine, paired to a two-motor hybrid system that replaces a transmission. Lithium-ion battery packs are located in the trunk, with the larger pack of the Energi plug-in hybrid cutting into cargo volume. But you might never know from the outside that either one isn’t a conventional Fusion unless you look closely. We rate the hybrid Fusions at 7 out of 10 possible points for their performance. They’re smooth and relatively powerful, and the cars remain rewarding to drive, with handling and roadholding closer to that of a sport sedan than the bland, beige mid-size sedans of yore. Both models updated their software last year that boosted fuel economy and range, but also gave the cars better response and a more conventional driving feel behind the wheel. The engine responses now correspond more closely to the car’s changes in road speed, reducing the disconnect between engine note and speed typical of earlier hybrids. The hybrid Fusions are somewhat less lithe in corners and heavier feeling than the lightest and most agile of the gasoline Fusions, but they still hold the road well and corner predictably and fairly flat. Our one complaint is rather low-geared steering, which requires more shuffling on twisty roads than we had expected. Brake blending is excellent; Ford and Toyota have the most experience in combining regenerative and friction braking of any hybrid makers, and it shows in largely seamless transitions. The Energi plug-in hybrid, rated this year at 22 miles of electric range, will recharge a depleted battery in 3 to 4 hours using a 240-volt Level 2 charging station, or about 7 hours on household current. The onboard charger runs at 3.3 kilowatts, slower than newer plug-in hybrids, but still acceptable for a majority of uses. The cover over the charging port on the left-front fender is pretty much the only distinguishing feature of an Energi against a Hybrid, unless you read the badges carefully.